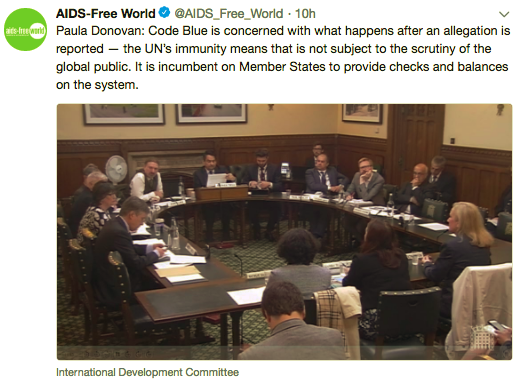 The Code Blue Campaign's Paula Donovan appeared as a key witness before the UK Parliament International Development Committee’s Inquiry on sexual exploitation and abuse in the aid sector on June 5, 2018. She provided "damning evidence" of the UN's failures and issued a "powerful" call for Member States to assert external oversight of the UN’s response to sexual harassment, exploitation, and abuse. Read Code Blue's written submission to the parliamentary committee's inquiry (posted April 18, 2018). Thank you for joining the Code Blue mailing list!